Once you’re in the photo/video list view, you’ll see a file manager of sorts for that conversation, complete with the file name and file format type of the various multimedia elements in the thread. Choosing a single recent item will also reveal it’s file size. 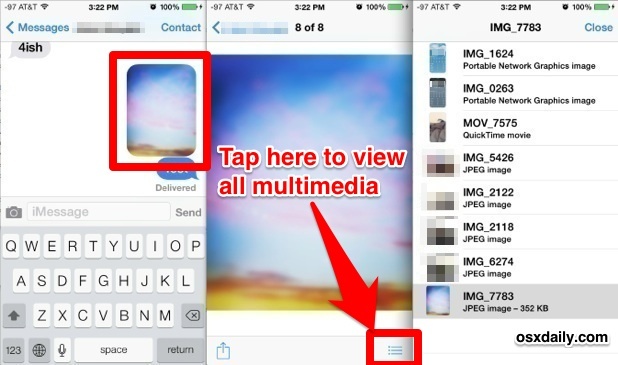 Tap on any single item to view it larger, than access the Share button to save or share it as usual. You can also just flip through the different images and movies as you would through the Photos app, except that everything within the multimedia sequence is limited to what has been exchanged between you and the recipient in that iMessage thread. Pictures and videos will stay viewable in this list view as long as that given message thread is maintained on the iOS device. In other words, if you noticed Messages app or a single thread is the culprit behind “Other” hogging space and delete a bunch of iMessage conversations, you will obviously lose the multimedia stored within those threads, and the list view of any past items. This works the same on any iOS device running 7.0 or later, including iPhone, iPad, and iPod touch. Note the person on the other side of the conversation does not need to have iMessage, let alone iOS 7 or even an iPhone or Apple device for this to work for you, the picture list is entirely on your user end. Unfortunately this feature only shows the last few photos in the conversation. The same photos seen if you scroll up. To see more media in this list, you need to “Load Earlier Messages” in the thread every time. Would be also very nice to be able to delete images from the list view. 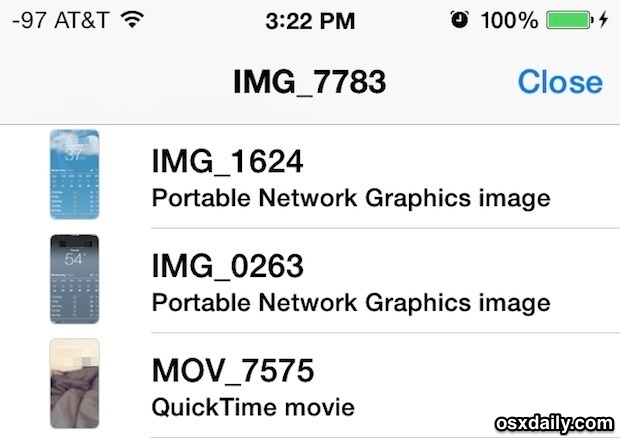 This would help with cleaning up the size of the iMessages and reducing the required iCloud backup storage. Doesn’t work. Would be nice if it did though. This has been tested on many iPhones with iOS 7 through 7.0.4, what are you using and with what iOS version? Paul, probably you already loaded full conversation somehow until you click the list button. Because all my friends and I with same iOS 7.0.4 has absolutely the same behaviour – this feature only shows the last few (!) photos in the conversation. when I view the larger picture, my share button is at the top left corner. Works for me. iOS7 isn’t different for different people, so you’re either not running 7 or doing it wrong. Doesn’t work for me too!! iOS 7, I try it in a all ways, with different conversations and attachments – it’s shows only last few photos in the conversation! If you’re only seeing some of the photos and not all of them, you must go to the top of that message conversation and tap on “Load Earlier Messages…” button to load more messages. Then you can tap the list button to see all the pictures and videos, including those from the past too. I know that, but it’s not useful. And current tutorial about “viewing ALL photos and videos”, that will be really nice to have. Click all the time “Load Earlier Messages” is very tiring. I hope Paul explain how to achieve all images by one click. Maybe it’s work only for iPhone 5S? This will only show the images/videos currently loaded into memory for that thread. Tested on an iPhone 5S. If you wanted to view all images since you started texting with them on your iOS device, you would have to scroll to the top and click “Load Earlier Messages” until you were at the beginning, then click a multimedia image, then click the “list” button making sure not to click back at any time or you have to start over. This is hardly a useful update. I can very easily scroll thought the images in the current portion of a conversation. It’s the ones from 6 months ago that I want easy access to, without going through “load earlier messages” a million times.